The following is a list of the campsites we stayed at on our travels with our comments on how we viewed the site. Remember that we were in France in low season (May and June) – sites may be very different in July and August! Des Quatre Vents at Crevecoeur en Brie (15 mins from Disneyland Paris). We were very impressed with this site – our first since arriving in France. Extremely friendly welcome from the owner who seemed to fall in love with the dogs. The pitches were the largest we’ve ever seen and each was bordered by high hedges which gave a good degree of privacy and the whole site was immaculate. Wifi was free and fast. We would stay there again without hesitation. Manoir de Bezolle at St Pereuse (Burgundy). This was the first of a few Les Castels sites we stayed at. If we’re honest, it wasn’t quite what we were expecting from a Les Castels – there was no grand Chateau or acres of formal garden as so strongly promoted by Les Castels. The new English owners are putting all their efforts into developing and improving the site. We managed to find a great pitch which gave us lots of space and privacy but we have a four wheel drive which enabled us to go up a steep hill to get to the pitch! The pitches are terraced and some may be beyond a front wheel drive car towing a caravan. The site really grew on us during our stay and the view over the countryside from our pitch was fantastic. Good mountain biking and walking nearby. We stayed 4 nights there. Wifi expensive though and we didn’t use it (it was the same, we were to find, at all the Les Castels sites). 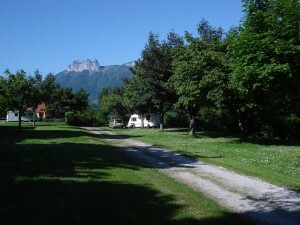 Camping Le Taillefer at Chaperon (Rhone Alpes). This site was small with no facilities to speak of other than showers, laundry and a few other things. Family run and very friendly and helpful. The only down side was unfortunate – close to the site a house was being built and the building noise started at 8am and continued through the day. However, we were out most days and the evenings were quiet and peaceful. We stayed 2 weeks here and would definitely stay there again. It was perfect for us – just the sort of place we like. It was more like a CL in the UK. Very central to activities around Lac d’Annecy and only 30 minutes from the beautiful town of Annecy. Le Bontemps near to Vienne (Rhone Alpes). We only stayed here on a night’s stopover but we were impressed. Fabulous facilities and lots of activities for kids. But the tannoy announcements of activities was a little too Hi-de-Hi for us! Wonderful acreage with singing frogs in the nature reserve! A river runs alongside the site. Wifi was 1euro for one hour. Dutch owners speak excellent English. Les Rivages at Millau (Midi Pyrenees). We really liked this site. A little scruffy at first view but it really grew on us. The pitches were large and well spaced with lots of trees and hedges to give you a little more personal space. Great facilities and on the edge of a river. We had a terrific view of the Millau bridge from our pitch. A ten minute walk takes you into the centre of Millau town. Unfortunately though, the site was targeted by thieves several times during our five night stay which possibly marred things a little. We would definitely visit again however. The reception staff were friendly and helpful. Wifi was FREE! Chateau de Leychoisier at Bonnac La Cote (near Limoges, Limousin). This site was not our cup of tea. Although in the grounds of a beautiful Chateau, the site was open and pitches unclearly marked, leading to haphazard parking of outfits and the feeling of being cramped. It is a useful stopover and the site fills up in the evening and empties in the morning so there’s a lot of coming and going. Wifi was ridiculously expensive and the charge for using the washing machine was more expensive than anywhere else we stayed (6 euros). We stayed there four nights and, to be fair, it was so hot on our last day, we did nothing except stay on our pitch and relax and, because the site had emptied out, it was very peaceful. But, be prepared for lots of coming and going in the evenings and mornings. We would use it as a stopover again but we wouldn’t want to stay any longer than that. Le Moulin Fort at Chenonceau (Loire). This was a nice site. Pitches were a little tight in places and ours was quite small but the trees and foliage everywhere stops you feeling hemmed in. The English owners run the site well and we enjoyed our stay. But, sadly, this site was also targeted by thieves and, on our last night there, three tents were slashed and belongings stolen. The site was vulnerable to these people coming in off the river bank and from the adjacent (small) lane. We would stay there again as there is lots to do in the area and the Loire is just stunning. Wifi was 1 euro for an hour and very fast. A nice sociable atmosphere. Le Colombier at Moyeux (Normandy). Wow! What a site this was. Our pitch was large but open with no trees or hedges to break things up. But, because the site was quiet, it didn’t bother us. There are other parts to the site which have more trees but we were given this particular pitch. 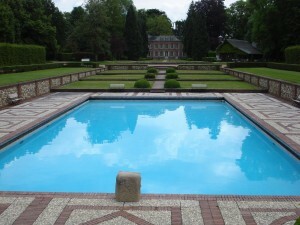 But, never mind that – it was the grounds of the site which impressed us the most. A beautiful grand house looked down over an avenue to a tower which housed a wonderful cosy, small bar at the top of the most wonderful swimming pool. There was a TV room in a converted barn which was more like a comfortable lounge with magazines and sofas. There was a creperie, a games room for ‘les jeunes’, crazy golf and acres of land to walk around. It was the thought that has gone into this site which really impressed us. We would return without a second’s hesitation. Wifi expensive. Le Bien Assise at Guines (10 minutes from Calais). A very busy site, popular for people at the beginning or end of their holidays as Calais is just down the road. The site is large with good facilities although it is a mix of touring pitches and fixed cabins. Very helpful reception staff. We had lots of rain here (to prepare us for the return to the UK!) and the ground did become slippery. We were lucky to have a very large, private pitch but some other pitches looked small and tight. The vet in Ardres was excellent (see the rest of the website for more information). Wifi once again way too expensive. Thanks for the list. I was thinking of visiting France again soon, and with a new pet Cavalier King Charles Spaniel, these look like excellent places to stay. I will be driving (camp/B&B + visiting friends) for about 5 weeks in June & July (2014) with my new Cavalier (she will be 9 months then.) Perhaps leave a post to say how it went with your Cav? They are sensitive little souls but mine is also fairly compliant! Fantastic info on the pet passport and just what I was looking for to put my mind at rest, well done. This was a very informative blog.Well constructed. I would like to hear from someone who takes their dog on a long ferry crossing which we are thinking about doing, as Dover and Calais a long drive both sides to reach Brittany where my family lives. Thank you so much for the info! Can’t wait to take my dog to France! I’m thinking of moving to France so this info has been very useful…I wondered if anyone has moved to France with their lurcher and whether anyone has any guidance on doggy etiquette over there? My lurcher is quite boisterous and I’m concerend about whether the French will accept him off lead or not. Any ideas would be great! Fantastic information – thanks so much for taking the time to share your experiences. Taking our collie cross and lurcher cross to France in September for the first time so will be making good use of your knowledge! I’d give DEFRA a call about this one if I were you. Between the UK and Ireland there are no Pet Passport restrictions (because there aren’t any between mainland UK and Northern Ireland). But I would think that you would need to go through the Pet Passport procedure between Ireland and France because otherwise it would be an easy route for rabies into the UK (because of the land border with Northern Ireland). that he ended up attacking another dog. He’s normally very friendly. It was quite expensive as well. This year we are travelling from Dublin to Holyhead which is only 192€ and then from Dover to Calais or else on the Eurotunnel for about £70. We went that way before and it was quite simple and the dog gets to say in the car all the time. The trip from Dublin to Holyhead with Irish Ferries is on 3 Hours 15 Mins compared to the 18 hour trip. Don’t forget when you leave Northern Ireland that you have to have a pet passport to travel in the South of Ireland. We take ours with us even when we go for an overnight. All in all, we would highly recommend a trip to France with your dog. It is so pleasant to sit outside the cafes with your dog and the French are so lovely and accommodating. We hope to move there eventually. The only thing I’m worried about is the restrictions on the beaches as you can’t really let your dog free and ours is like a beating bear if he doesn’t get off the lead. You can ring DARD NI on 028 9054 5885. They are very helpful. I liaise direct with them by email – it keeps everything straight but sorry I can’t give you the email address due to data protection. We live in Antrim and use Firmount Veterinary Clinic. I think you need to make sure you apply for the passport a couple of months in advance which you do direct with DARD. Once they send it out you just need to attend to the rabies injections and worming – check the timing in good time before your trip. You also need to make sure the dog’s booster is up to date. The whole passport now only costs £90 – brilliant as our first one was over £300. Hope this helps and that you enjoy your trip. Can anyone tell me if there is a good kennel, caravan site near the tunnel as would like to go over to England to stock up on supplies but leave the caravan and dogs for the day ? We stayed at the following campsites which were really fine with dogs. St Pair Sur Mer Chateaux de lex Eaux site in Normandy worked fine too. our dog was allowed in the bar and there is a lot of grass to walk about on the site. We were only there one night so didnt investigate if dog could be off lead to run anywhere. Due to visit France in the next few weeks, any info on if the dog has to be insured in France? We’re Canadians who moved to France (Languedoc) 17 years ago. We have a camper van and two small terriers (a Jack Russell and a Spanish ratter). We’ve been camping for 3 years with the dogs and have found some great sites. We’re in one now, called Camping les Terrasses, just outside Saint Chinian (very good wine). Good places next to the campsite to walk the dogs and even to let them off their leads; not always easy with these two) and the new owners are lovely. Camping Le Mas de l’Église, close to Anduze, is another very good campsite, with simple but clean and well-kept facilities, lots of trees and grass, friendly, helpful owners who are very accommodating. Anyone with calmer dogs than ours would have lots of places to let their dogs off their leads. 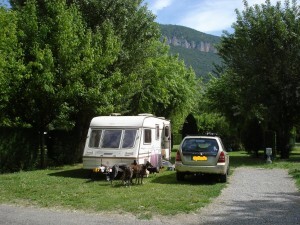 We also love one at the edge of St Jean Pla de Corts, near Céret, called Camping de la Vallée. Again, lots of good places to walk where more compliant dogs could be let off their leads, though we did find a path along the river, well away from any roads, where we were able to let them run free.